FROM ACADEMY AWARD®-WINNING DIRECTOR DANNY BOYLE* (Slumdog Millionaire) comes the powerfully uplifting true story of one man's struggle to survive against mountainous odds. 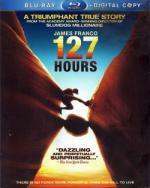 Aron Ralston (James Franco) has a passion for all things outdoors. But when a falling boulder traps him in a remote Utah canyon, a thrill-seeker's adventure becomes the challenge of a lifetime. Over the next five days, Ralston embarks on a remarkable personal journey in which he relies on the memories of family and friends — as well as his own courage and ingenuity — to turn adversity into triumph! This is a great film - and made so by the extraordinary performance by James Franco. It's his film; no other character is anything other than minor. He must carry the whole film on his shoulders and he does so easily. He truly portrays the intensity of the situation, the increasing desperation, thirst, exhaustion, despair - and ultimately determination and hope. You really must see the film, if for no other reason than Franco's performance. The rest of the film is very well done. There is a meticulous interest in the small details of Ralson's claustrophobic situation, beautiful cinematography of the countryside he takes his fateful hike in, creative use of the camera that both gives the film movement and emphasizes the immobility. Just about perfect in every way, a great adventure film, a triumph of the spirit. Highly recommended.